This luxe homestead set in the Robe bushland is a Fayre beauty. Five years ago when Sarah Beattie and Graeme Coxon bought Fayrefield House it wasn't actually a house. It wasn't even half a house. In fact it was barely half a wall. Back in 2010 the only part of this stunning two storey Victorian mansion that was actually standing was a small portion of stone wall, crumbling away on its own on top of a grassy hill, surrounded by gum trees. But the sweeping views, the incredible sunrises and the location - just 10 minutes drive from the ever popular seaside town of Robe - were enough to convince the two that the wall was worth rebuilding into a house. And so they did, creating a brand new residence out of carefully matched hand-hewn stone and rustic timber that, incredibly, looks like it's always been there. Fittingly for a house that seemingly rose up from nothing, Fayrefield seems to rise out of the vast expanse of lush green paddocks as you drive up the winding dirt road towards it. One minute you're marvelling at countryside and the next, there it is, grand and gleaming white in the sun. Enter through the light and airy glass-walled conservatory (a perfect place to enjoy your included breakfast, by the way), and you're smack bang in the heart of the place - Fayrefield's huge kitchen, fitted out with restaurant standard stainless steel equipment, including a walk in cool room. It looks daunting but it's all fairly easy to use, not that you need to - for an extra fee Fayrefield offers the services of a professional chef, which you might want if you decide to invite friends around and make full use of the house's rustic 20 seater dining room. If you're feeling a bit more splendid you might want to use the front entrance instead - a heavy wooden door that opens to reveal an opulent looking lobby with a grand staircase just begging for you to go all Scarlett O'Hara on it. 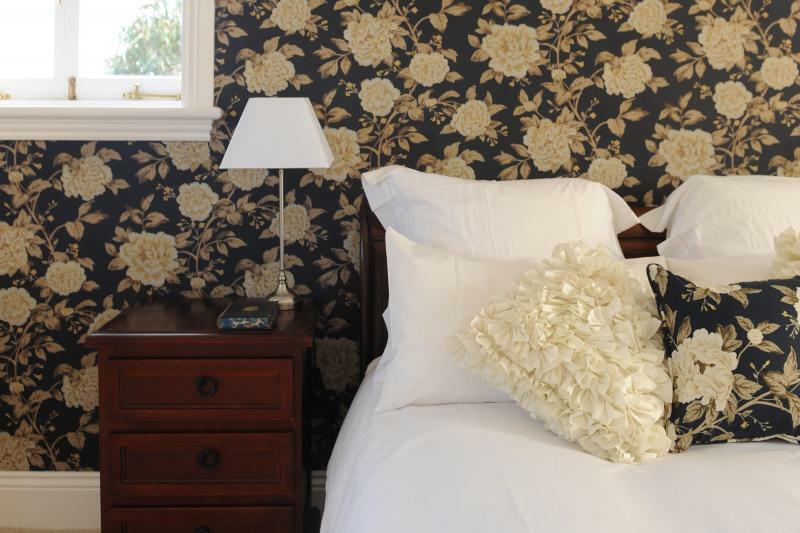 There are three bedrooms, two upstairs and one downstairs, all beautifully decorated with reproduction vintage wallpaper and chic minimalist furnishings. The Master Suite has its own huge ensuite with two person shower (but sadly no toiletries - better bring your own), and even bigger walk-in wardrobe. Honestly, it's gigantic - most travellers will struggle to fill a quarter of the thing, even if staying for a month. Fayrefield is clearly best utilised by group bookings, for weddings or parties where people can sleep over afterwards, but single rooms are also available and it does make for a relaxing getaway - especially if you're lucky enough to get the place to yourself.